Is your mouth filled with silver or gold fillings? There are many people who have opted for metal fillings over tooth colored ones. There are also those folks who never had an option. There were periods in dental history where color-matched composite resin fillings were nothing but a pipe dream. 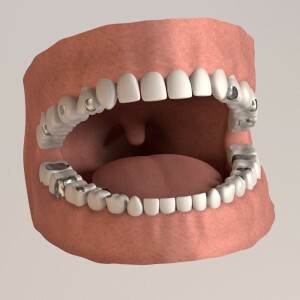 Now, people who still sport metal fillings are often curious if they should have them removed and replaced with fillings which will blend in with their teeth. Once upon a time, cavities were filled with amalgam fillings, which were made from a combination of silver, zinc, mercury, tin, and other trace metals. Over time, a great debate about the safety of amalgam fillings developed. Medical professionals feared that the mercury in these dental restorations would get into patients’ bloodstreams and cause health problems. Why? Because amalgam fillings were known to leak after years of gnashing and biting, ultimately causing them to break down and irritate the decaying tooth underneath. Because Dr. Ganjoor and our team at Celina Family Dentistry are dedicated to providing our patients with the best dental care possible, we only place composite resin dental fillings. To put it simply, composite resin dental fillings are the complete opposite of amalgam fillings, except for the fact that they do the same job. Instead of being made from mercury and other trace metals, composite resin fillings are made from composite resin—a tooth-colored, biocompatible, putty-like substance. Instead of creating dark patches in an otherwise all-white smile, composite resin dental fillings are tinted to precisely match the color of your surrounding teeth. Instead of breaking down and leaking after normal wear and tear, composite resin dental fillings are known to stay stable and intact for years after they’re placed. Are you in need of a white filling, or are you curious about replacing old amalgam fillings? Dr. Ganjoor can help both men and women maintain healthy, beautiful smiles for life. Contact our Celina dentist office at (214) 851-0130 to schedule an appointment. We welcome patients from Celina, Prosper, Gunter, Frisco, McKinney, Aubrey, Pilot Point, Anna, and surrounding areas.